The TV show upon which director Joe Carnahan’s movie is based ran for five seasons from 1983–87 (you can find my review of Season 3, here). One of the actors from that show, Mr T, still turns up in helicopters to emasculate pale guys in boardies by their own pool with a megaphone, all in aid of a chocolate commercial. So much for the famous "I ain't gettin' on no plane!" catchphrase. Instead of the Vietnam War, we now have the Iraq War. Four soldiers who don’t quite fit the order of military life are brought together through a haphazard chain of events at the US/Mexico border than ends explosively. They are allowed to remain together because, though unorthodox, their approach gets results. They have been entrusted in a covert operation to recover printing plates for US currency, which had been held by the Dictator of Baghdad, and to ensure they do not end up in the hands of “the enemy” (I seem to recall it was Iran). The op is so covert in fact, not even their superior in the army (Jessica Biel as a hard-as-steel Charisa Sosa) nor CIA agent Lynch (Patrick Wilson) are aware they will do it, but they have their suspicions. Thus ensues a vast array of flying, explosions and more explosions, and sailing across Germany and California before the bad guys (who are found) are exposed and all is well, ready for a sequel(s). Liam Neeson is Hannibal (the strategist); Quinton 'Rampage' Jackson is B.A. 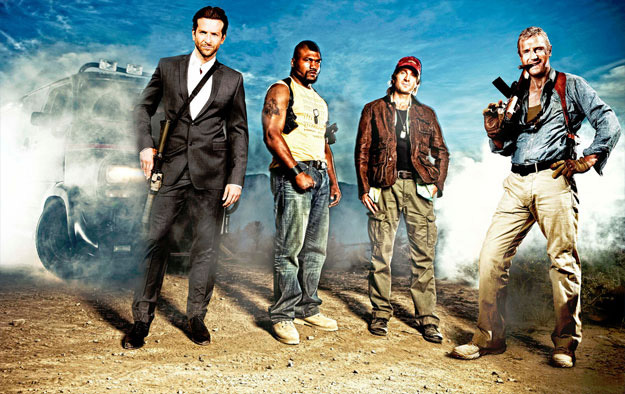 Baracus (the black strongman, who has time for a moral struggle and Ghandi quotes, and formerly played by Mr T); Sharlto Copley is Murdock (kooky, borderline-crazy ace pilot); and Bradley Cooper is Face (good-looking smugness with a six-pack and ego to match). The Alpha Team works best when it works together, don’t you know. Call me a cynic, but once I found out Ridley Scott was involved (he of the empty gleam of Black Hawk Down), so much became clear. There is no semblance of the kitschy redemption of the TV show, which, through ageing, can provide some reward. Instead, it’s all glass and steel high-tech sheen and defence acronyms akimbo. Watch out of the “They’re flying a tank!” goings-on. And even though Neeson seems to be an old shoe at blockbusters now (Batman, Clash of the Titans), it was weird to see him doing this gung-ho stuff after subtle work as sexologist Alfred Kinsey in Kinsey. I did like the way the CIA was shown to be a heady mix of incompetence, decadence and corruption (they’re not going to let September 11 go that easily!) but this was done more as caricature, personalised in the psychosis of Lynch, rather than shown as systemic malaise. Were I a Mexican or German, I would be even more offended. I wouldn’t recommend this without popcorn and a giant sugary Coke (Zero or Diet will not do). Then again, you could take the healthy option and skip it.